We do so much to care for our dogs, such as grooming them and giving them plenty of fitness and healthy food. However, pet owners can tend to neglect their dog's teeth. If your dog has a toothache or gum disease, he's dealing with pain that you may not even be aware of. Veterinarians estimate that 85% of dogs over the age 4 have some form of gum disease. Left untreated, dental infections can lead to a loss of appetite, broken or lost teeth. Eventually, these infections can spread into the bloodstream and damage other organs. Luckily, your dog does not have to be a part of this unfortunate statistic. Following these simple guidelines to care for your dog's teeth can help prevent most of these problems. It is not uncommon for a dog's breath to be slightly unpleasant. Bacteria build-up in the mouth can cause bad breath and often indicates that your dog needs better dental care. However, it's not a bad idea to check with your vet to make sure that the bad breath is not a sign of an underlying medical problem. There are a plethora of options for treats and diets that can help your dog reduce plaque and tartar and improve their breath. 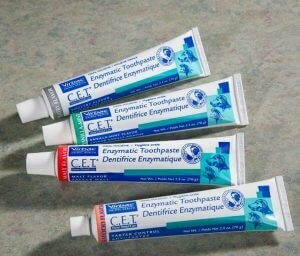 These present the simplest option to start cleaning your dog's teeth without him even knowing it. Dogs that chew actively have less plaque build-up as the mechanical action of chewing can reduce plaque by up to 70%. Rawhide or knucklebone. Knucklebones are softer and gentler on teeth. Never give them harder items such as the bones from a steak, hooves, or ribs as they can fracture teeth. Use fresh bones with meat and cartilage with caution as there is a greater risk of bacterial contamination or ingestion of sharp bone fragments by aggressive chewers. 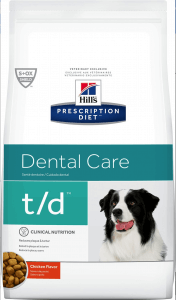 Dogs love to eat and many treats have been specially formulated to help aid in plaque reduction. 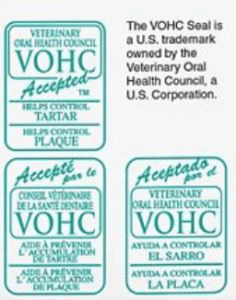 Make sure that whichever brand you choose has an approval seal from The Veterinary Oral Health Council (VOHC). This organization evaluates pet products to see if they meet standards for reducing plaque or tartar by at least 10%. For a list of VOHC approved products, go to http://www.vohc.org/VOHCAcceptedProductsTable_Dogs.pdf. Always choose rubber or nylon toys with a texturized surface featuring bumps or a rough surface. This helps aid the mechanical action of scraping away plaque and dirt. These can be an especially good option for dogs that chew through dental treats too quickly. Like some dog dental treats, some dog foods have special formulations to help reduce plaque and tartar. They do this in a variety of ways, including larger kibbles, textures that resist crumbling, and special coatings that help prevent or reduce bacteria, plaque, and tartar. Experiment with different types of treats and toys and see what your dog likes. 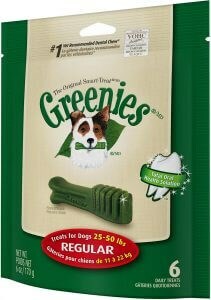 You might want to choose a firmer treat if your dog seems to be chewing through a treat too quickly. Edible treats can quickly add calories, so be careful to limit them. The smaller your dog is, the fewer treats they should be given. Ask your vet if you have questions about this. Working your way toward using a doggie toothbrush is the most effective way to get rid of bad breath, bacteria, plaque, and tartar. This will prevent sore gums and cavities on your dog's teeth. There are some baby steps you can take to help get your used to the idea of you being near their mouth with a dental tool. The best time to get your dog accustomed to you cleaning their teeth is when they are a puppy, but don't worry if your dog is fully grown. It is never too late for them to start getting used to you cleaning their teeth! Ideally, you should brush your dog's teeth every day, but that is not realistic for most pet owners, so aim for 3-4 times per week. 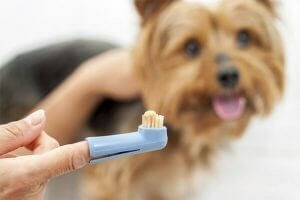 The easiest way to slowly introduce your dog to dental brushing is to use tools you already have in your house such as a damp cloth or gauze. Start with something familiar that you know your pup will like, such as a little peanut butter or baby food. This will get them comfortable with you getting near their mouth and teeth with your fingers. From there, you can start using a fingertip style toothbrush, similar to a thimble, that is placed onto your finger. 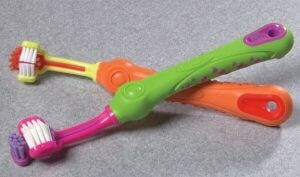 An alternative option to a fingertip style toothbrush is a canine toothbrush. 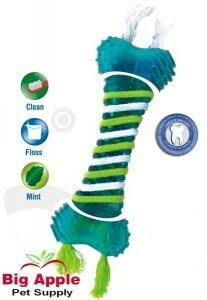 These feature toothbrush bristles that are more angled to allow easier cleaning of your dog's teeth. It is unlikely that your dog will learn to spit, so never use human toothpaste on your dog as it contains detergents and abrasives that are not safe to swallow. Grab a tube of canine toothpaste, which is often flavored with poultry or seafood options that your pup will likely prefer. Depending on your dog's age and background, it can take several days to several weeks to gain cooperation. Have patience and do not rush it. Start with just a few teeth at a time and work your way up to the whole mouth. Don't be discouraged if your dog only lets you clean half his mouth. Just remember which side it was and get the other side the next day! Conclude with a special reward - play, treat, or affection - even if the process didn't go well. This way, your dog learns a positive association with brushing and may make him more agreeable next time. It is important for your dog to visit the veterinary dentist routinely similar to how it is important for us to go to the dentist at least twice a year for routine check-ups and cleanings. Do your best to make your dog's trip to the dentist as comfortable as possible. While you may have some dental anxiety, your dog doesn’t have to know that! Your faithful companion is the master of reading your emotions! 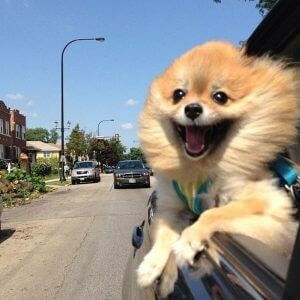 When you get into the car, it’s important to act excited just like any other outing. If you’re feeling anxious, your dog will pick up on that and may start to feel anxious as well. If it's convenient, start by making a dry run to the vet just for a meet and greet. Let your dog say "hello" to the staff, sniff out the waiting room, and sample a treat. When you set up your appointment, find out if you'll be able to stay with your pet, if they accept your pet's insurance, and ask any other questions you might have. Be sure to ask if there are any specific instructions you need to follow before your pet's visit as dental procedures are often done under anesthesia, so proper preparation is important. Good dental care, both at home and at the vet, is essential to maintaining your pet's health. With patience and practice, dental care can become an easy part of your dog's daily routine.